A wonderfully structured cricket experience bringing development, progression and more importantly fun and enjoyment to cricketers of all ages and abilities. Thanks for yesterday. 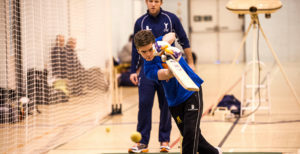 George enjoyed the coaching session and said he'd give a 9/10 as there were a good number of boys and a range of activities. Spiro, Just a quick thank you for your work with Thomas' bowling this winter. First match of season defending 68 and he has bowled beautifully - 4-1-12-2 including a double wicket maiden and could have had four or five. Cheers pal. Following the Warks trials today, Hannah has been selected as a reserve in the U13 squad. We wanted to say a big thank you to you and the team for all the winter coaching and support (esp. Steve and Daryl) as it really paying off!